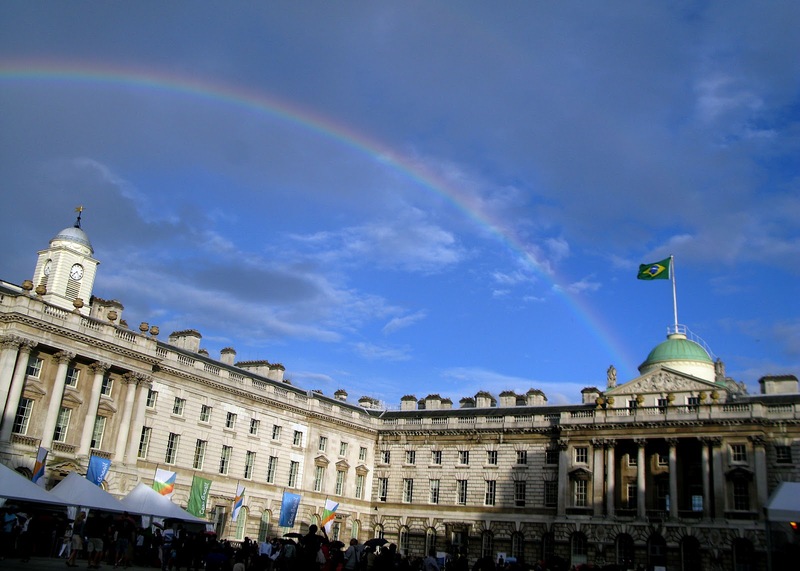 This Thursday the brazilian happy hour at the courtyard of Somerset House in London, brought together hundreds of people to watch the presentation of Fabio Allman, from Monobloco band, together with the group "Nota Deis", formed by Brazilian musicians living in the British capital. The sunny day ended with some outbreaks of rain, which formed a beautiful rainbow above the Somerset House, giving a special touch to the event. On Friday the program also promises to shake up the audience, who has been attending daily from 18h to enjoy Brazilian rhythms. The program that opens the weekend includes Kita Stewer Sambasoul and Transatlantic, the band "Sargento Pimenta" and DJ's playing traditional carnival music.